In 2008, the Navarra Quartet won the Outstanding Young Artist Award at the MIDEM Classique Awards in Cannes. They were selected for representation by Young Concert Artists Trust in 2006, and in 2007 received a Borletti-Buitoni Trust Fellowship culminating in a highly acclaimed disc of Haydn’s “Seven Last Words of Christ on the Cross”. Formed in 2002 at the Royal Northern College of Music under the guidance of the late Dr Christopher Rowland and Alasdair Tait, and subsequently as postgraduate students of the Alban Berg Quartet in Cologne, they are now Quartet in Association at the RNCM. 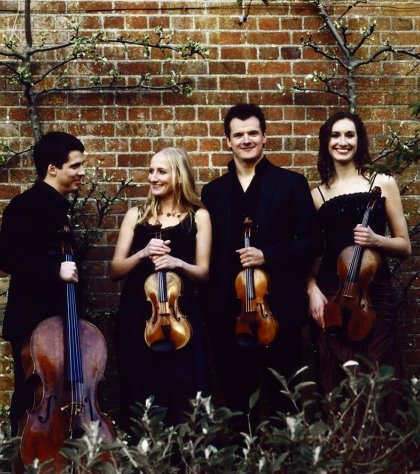 In 2007, the Quartet won second prize at the Melbourne International Competition and in 2005 1st Prize in the Florence International Competition. At the opening of the 2009/10 season, the Quartet returned to Australia to give recitals in Melbourne, Sydney and the Huntingdon Estate Music Festival under the auspices of Musica Viva. They went on to appear at Wigmore Hall, the Bath Festival and Aldeburgh, and gave recitals in France (as Laureates of the Aix-en-Provence Festival), Switzerland, Italy, Ireland and the Netherlands. In 2010, the Quartet recorded their first CD for Challenge Records of Peteris Vasks’ Quartets and took part in the BBC Proms Chamber music series at Cadogan Hall with pianist Francesco Piemontesi. Future engagements include return visits to Wigmore Hall and the Concertgebouw in Amsterdam. Over the last two years, the Quartet has increasingly developed their international profile, appearing at major festivals and venues throughout Europe including the Philharmonie in Luxembourg, the Konzerthaus in Berlin, the Schwetzinger, Rheingau and Mecklenburg-Vorpommern Festivals in Germany, the Aix-en-Provence and Bellerive Festivals and the Kattegat and Sandviken Festivals in Sweden. Further afield, they have given concerts in Russia, the USA and Bahrain. In 2009, they took part in the Haydn series at Wigmore Hall (broadcast by BBC Radio 3) and recorded Haydn’s “Seven Last Words on the Cross” for Altara Records, for which they commissioned nine paintings for illustrated performances from the world-renowned artist Jamie Boyd. They also worked with Wayne MacGregor’s Random Dance Company on a new work (Entity) with music by Joby Talbot, giving a series of performances at Sadler’s Wells, Snape Maltings and the Muziektheater in Amsterdam. The Quartet has collaborated with the Elias, Australian, Heath and Sacconi Quartets, Li-Wei, Matthew Barley, Richard Harwood, Guy Johnston, Hansjörg Schellenberger, Jiri Hudec, Julius Drake, Allan Clayton, Patricia Bardon, John O’Conor and Alasdair Tait. They have taken part in the International Musicians Seminar at Prussia Cove and in 2008 were resident Quartet at the Britten-Pears School in Aldeburgh and at the Verbier Festival in Switzerland. The Quartet has broadcast for BBC Radio 3, RAI 3 (Italy), Radio 4 (Holland), SWR (Germany), Radio Luxembourg and ABC Classic FM (Australia). I met the four members (Magnus Johnston and Marije Ploemacher, violin; Simone van der Giessen, viola; Nathaniel Boyd, cello) on Tuesday morning, 16 November, at the BIM House in Amsterdam, when they were preparing for the TV broadcast of VPRO’s ‘Vrije Geluiden’. They were about to perform the third movement (Adagio) from Peteris Vasks’s String Quartet No 3 (1995). Chamber music, with the string quartet in its epicentre, typically offers the very best of the creative output of any composer. Above all, it enables us to witness his deepest thoughts and emotions. Compared to a string quartet, an orchestral work, irrespective of its beauty and impact, may even sound crude, with far less gradation. Susan Tomes, the pianist of the Florestan Trio (they record for the Hyperion label) wrote that many composers used chamber music to give us the truest portraits of themselves, their most intimate thoughts and feelings. There is no multiplication of means and effects, which sometimes makes orchestral music seem coarse. Instead, there is that wonderful conversation between people with meaningful things to say. With one person on each part, everyone is vital, and each player influences the others in an unpredictable way. Playing chamber music is like digesting life in the company of a newly acquired family. It seems to be in that perfect if not ideal periphery of the great orchestral hemisphere, where each and every string is magically touched and where a mere four individuals create all those many delicacies just to be sipped and savoured by their audiences. No wonder most connoisseurs are to be found in the field of chamber music! Any string quartet, or any musical group for that matter, must work together closely as a real team, in order to steer clear of common oddities and pitfalls, but perhaps first and foremost each and every player should have the open mind and attitude that is needed to resolve interpretative problems when rehearsing together. On stage, it all comes down to strong emotional involvement in perfect balance with one another, ranging from immaculate phrasing to finely shaded dynamics. No wonder, really, that on their latest CD (Challenge Classics CC72365) the Navarra Quartet play the three string quartets by the Latvian composer Peteris Vasks (b. 1946) with such compassion and inner beauty that the dark music can really gradually emerge from its abysmal depths, where a culture seems to dwell on the threshold of evaporation. These bold performances deliver a strongly poetic and dramatic pulse, at the same time underlining the beautiful organic qualities of these works. After hearing their magnificent recording, I am entirely convinced that the Navarra’s almost telescopic resources make them ideal advocates of contemporary music. In need of further proof? Just go to their live recording on the Sonimage label of Ravel’s String Quartet and Shostakovich’ String Quartet No 5. How important is innovation in the creative arts, and particularly in music? Nathaniel: “The main question is, where should we put the emphasis? On innovation or on sincerity of expression? Or both?” I gave him my answer: on both.